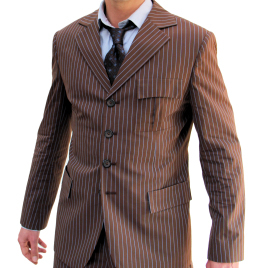 It's been said before but worth saying again, this is probably the more accurate Tennant suit you can buy without hunting down the original fabrics and costume designer. It is also a fantastic suit in its own right. Every time I've worn mine (with ties also from Magnoli) I've had nothing but compliments about it. I currently have the brown version but will be saving up for the blue. I'd also highly recommend getting the required measurements taken by a tailor; I did and the suit fits like a glove. I'd highly recommend the suit to anyone thinking about getting one.